Ebbetts Pass is the trail head for the Pacific Crest Trail on Highway 4. Ebbetts Pass is an excellent entry point into either the Carson-Iceberg Wilderness to the South and the Mokelumne Wilderness to the North. Here we are concerned with hiking South to cross the 29.44 mile length of the Carson-Iceberg Wilderness along the Pacific Crest Trail route. From Ebbetts Pass to Noble Lake we cross Noble Canyon and its attending headwaters bowl under the Northeast flank of Tyron Peak. From Ebbetts Pass we descend to a point where the trail crosses Noble Creek high up in the canyon. This is the low point of the trail between Ebbetts Pass and the high point on Tyron Peak. The trail from Noble Creek climbs in both directions. Southbound we traverse up across a great shoulder of treeless volcanic terrain to the switchbacks below Noble Lake. At Noble Lake we may find the water fouled by stock, and the camp / break spot littered with cow pies. Noble Lake needs some stock fencing to keep the cattle from accessing the whole lakeshore. 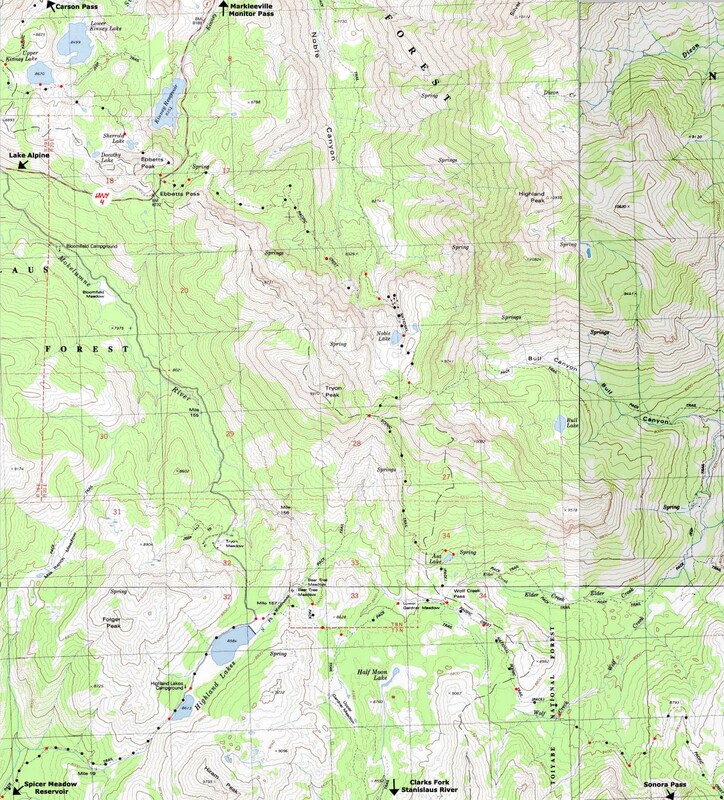 This topo hiking map depicts 4.92 miles of the Pacific Crest Trail South from the Ebbetts Pass Trail head to the high point of the PCT over the East shoulder of Tyron Peak. The links below and above will bring you to the maps heading North to Meeks Bay in the Lake Tahoe Basin and South to Tuolumne Meadows in Yosemite. (May 22 2012) Soon the maps miles, elevations, images, videos and trail guide will run through the Whitney Portal. Select your quadrangle, then click the marker. Select your map size, and click "download."